Interested in getting fiber optic internet, but it’s not in your neighborhood yet? Join the Quick Connect list! The Quick Connect list is the easiest and best method to receive updates and communications from Mainstream Fiber, plus, when we construct our network, we construct around demand for our services, so the more people that join the Quick Connect list in your area, the faster you’ll get fiber. That’s why it’s extremely important to join the list if you’re interested in getting fiber! And if you can, tell your neighbors so that they can join as well! Still not convinced? If you join the Quick Connect list you’ll receive two additional benefits: you’ll receive an update the moment that you can sign up for service in your neighborhood, and also you’ll be notified of any limited offers that might come along. How do you join the Quick Connect list? Simple, just go here and fill out your information, or call our office at (844) 752-6736 and say you want to join the Quick Connect list! If you’ve already taken our survey, sit back and relax, as you were already added to the list! At Mainstream Fiber Networks, we are committed to bringing fast, reliable, and affordable internet to the under-served parts of Indiana. This week, we are proud to announce that several neighborhoods throughout Harrison and Brown County are entering the sign up phase! That means that if you live in those areas, you can sign up for internet service today, and be in the first round of installation when construction begins in your area! Also, we are moving into Floyd County! If you’re a resident of Floyd County and are interested in high speed fiber optic internet, please join our Quick Connect list to stay updated on the project, to be notified the moment construction starts in your area, and to hear about any limited offers! A real Mainstream employee should be relatively easy to pick out if you meet them in person, as they will likely be wearing apparel with the Mainstream logo on it. If they are not in Mainstream branded apparel, they will always have an ID badge with the Mainstream Fiber logo attached to it. Caller ID should list each of these numbers as being from Mainstream Fiber Networks, but it sometimes might not. If you ever receive a call from a number that says “No Caller ID”, “Blocked”, or “Restricted”, it is never from Mainstream Fiber Networks regardless of what the person on the line says. Mainstream employees will start a phone conversation by stating their name and that they work for Mainstream. If you’re still unsure if it’s an actual Mainstream employee, ask for their name and then ask if you can call them back. An actual employee from Mainstream should have no problem with that. As far as telling if an email is actually from us, know that it will come from an email address ending with either @msfiber.net or @msfibermail.net. The email itself should have our logo displayed prominently on the email somewhere as well, either at the very top of the email or at the bottom with the employee’s signature. When it comes to servicing and prices, pricing is always available on our website at msfiber.net, as are our services. Any new services or changes to price will be announced both on our website and on our Facebook page, so if you want to have the most updated information, those two places are your best bet. As always, all questions can be directed to us on Facebook or by calling our office at (844) 720-9423. 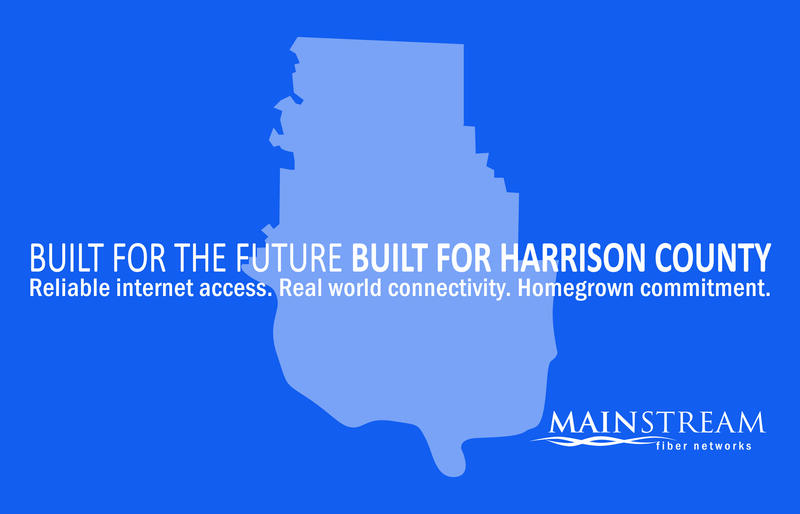 Mainstream Fiber Networks is proud to announce that we have built over 120 miles of fiber optic cable infrastructure throughout Harrison County. This includes both our mainline project as well as several adjoining neighborhoods that had high participation in our interest survey. Because of this, we are now able to provide our services to approximately 10,000 households in the area, and that number will only continue to grow over the upcoming years. Mainstream Fiber is the only fiber optic internet service provider in Harrison County: our service starts at 50 mbps download speed and extends all the way up to 1 Gbps. Beyond that, our service is not, and will never be data capped or throttled. If you’re interested in getting reliable high speed fiber internet, we may already be available in your neighborhood. Call us at (844) 752 – 6736 , check online at msfiber.net, or visit our regional office in Corydon at 2370 Landmark Way to see if you can get signed up today. If we are not already in your area, please take our survey at msfiber.net and encourage your neighbors to do the same. We rely on demand to expand our network, so the most proactive neighborhoods will be connected first, not only that, but taking the survey ensures that you will be notified the moment construction of our network begins in your area. Join the many who have already completed this step, as we continue to grow and expand all throughout Harrison County. Mainstream Fiber is a locally owned and operated internet service provider, headquartered in Nashville, Indiana, dedicated to bringing high speed, reliable, and affordable internet service to un-served or underserved communities throughout Indiana. Mainstream Fiber operates independently, completing nearly every facet of providing fiber optic services internally, from construction, to network management, to operations and administration. Beginning on Wednesday, July 25th next week, and concluding on August 1st, Mainstream Fiber is organizing a scavenger hunt in Harrison County called “Follow the Fiber”. What is “Follow the Fiber?” Well, you may have noticed our trucks and workers all along Harrison County, building a fiber optic infrastructure, this has all been to finish the Harrison County Loop, a massive project where we built over 115 miles of fiber optic infrastructure all around Harrison County, and the loop itself is getting close to being finished. In order to celebrate, we’ve decided to put on this event. As stated above, throughout the county we’ve created a number of stops, at each stop is a QR code; scanning a code will provide you with interesting facts about the history of fiber, the history of Mainstream, and other exciting content, plus it will tell you where to find the next station. If you happen to be one of the first five people to complete the route, you’ll win a $50 Visa gift card! Sound like fun? Well, the first stop is at the Mainstream Fiber office on 2370 Landmark Way, in Corydon, if you stop by there any time between July 25th and August 1st, an employee will be there to give you more details about the event and send you on your way. If you’d like more details on the event, please check it out here. You may be shocked to hear this, but fiber optics have existed since the late 1800s, of course they were nowhere near as sophisticated as their modern form. It stared with extremely humble roots, being nothing more than bent glass tubes which were used to illuminate difficult to see areas during medical procedures. However, in 1880 Alexander Graham Bell, perhaps best known as the inventor of the telephone, created something called the Photophone. This invention allowed for the transfer of sound on a beam of light; although Bell considered this to be his greatest invention, the practical uses weren’t discovered until many decades later, but it did much to spur on others. One such example was Clarence Hansell and John Baird who in the 1920s showed that a simple image could be transferred through glass tubes over very short distances. In 1953, their discovery was expounded upon when physicists Harold Hopkins and Narinder Kapany succeeded in transferring an image over 75 centimeters using a bundle of 10,000 glass fibers. 7 years later, in 1960, Narinder Kapany would coin the term “fiber optics” in an Scientific American article that would introduce the concept to the wider world. Many fiber optic advances were made over the following decades, allowing more data to be transferred over greater distances and at greater speeds, until in 1965 when Manfred Borner created the first fiber optic data transmission system, or fiber optics as we know them today. Although still very primitive compared to the fiber optic technology of today it allowed for a steady uninterrupted stream of data to pass through it without any sort of data loss or corruption. This invention was soon commercialized, and in April 1977 Long Beach, California, became the first US city to use fiber optics, using it to send telephone traffic throughout the city. After this, fiber optics began getting more sophisticated and more uses were found for them, fiber optics were even connecting different countries, as in 1988 when fiber optic cable was used to connect France and Britain to the US. Of course, in the 1990s and 2000s as the internet exploded in popularity and usage, it became clear the traditional methods of data transfer, copper cables, would not be enough to keep up with the traffic, and so fiber optical technology was looked at and applied to the problem. As it stands now, all across the country fiber optic infrastructure is being set up across the country, allowing for much faster and reliable internet access, and we at Mainstream Fiber are proud to be a part of these developments! What’s the big deal with fiber optic internet? What does “fiber optic” mean? Fiber optic cables are a bundle of thin glass threads, also known as the fibers, which can quickly and easily transport light waves. Messages and information can be modulated onto these light waves, which allows fiber optic cables the ability to transmit data, this is essentially how fiber optic internet works. Now, you may be wondering, what advantage does this have over the traditional copper cables found in power lines? Well, fiber optics have a slew of advantages over these traditional metal lines. First and perhaps most noticeably, fiber optic cables have a much greater bandwidth than traditional metal cables. Bandwidth is the maximum amount of data that can be transferred through something, almost like water through a pipe; more bandwidth means more data can be pushed through. What this means for you is that if you and all your neighbors are downloading something at once, with more traditional metal cables, you and all your neighbors will experience a noticeable slowdown, because there simply isn’t enough room for all the data to move through the cable, whereas, with fiber optic cable, there won’t be any slowdown in a similar situation. Secondly, in order for traditional metal cables to transfer computer data, they must break down digital signals, the natural form of computer data, into electrical signals. As anyone who has played with electricity in school knows, electrical signals are susceptible to interference from other electrical devices, magnetic fields, and even radio signals. Fiber optic cables on the other hand, use digital signals, which cannot be interfered with as easily. Third, fiber optic cables are much thinner and lighter than traditional wires, so more fibers can be bundled into a given diameter of cable, allowing even more bandwidth. Not only that, but fiber optic cables are 4-8 times stronger than traditional copper cables of the same diameter, making them far less likely to be damaged, this means that your service is far more reliable. Not only are the cables stronger and lighter, but because they carry light and digital signals rather than electrical signals, there’s no electricity passed through them, meaning there’s no fire or electrical hazard associated with them. If you’re worried about the security of your data through fiber optics, you needn’t worry as much as with traditional metal cables. Unlike copper wiring, which can be tapped into, it is not possible to tap into fiber optic cables. Since the cables are made of glass, any attempt at tapping the cable will simply break it. Finally, and perhaps most importantly, fiber is said to be “future proof”. Although that statement is a bit of an exaggeration, it does have some merit, because with fiber data is transmitted at the speed of light, the rate of connection is only limited by the equipment itself rather than the fiber, which will allow for substantial speed improvements by equipment upgrades long before the fiber itself must be upgraded. Mainstream Fiber Networks is dedicated to giving you the best internet service around, with great speed, reliable connectivity, and internet solutions that fit your needs, and we are able to do that due to the benefits of fiber optics. Fiber internet runs about five times faster than other internet sources and provides a variety of benefits to users. But did you know that not all fiber connections are 100% fiber cables? Fiber can be installed in a variety of ways including fiber to the neighborhood, fiber to the curb, and fiber to your home. Companies will install fiber cable up to the beginning of the neighborhood. From there, they connect the homes to the main fiber line using copper cables. This is similar to fiber to the neighborhood, although companies will install fiber closer to the properties. This keeps the connection stronger while still using just one fiber line. Copper cables are then placed from the mainline fiber cable along the street to the home. 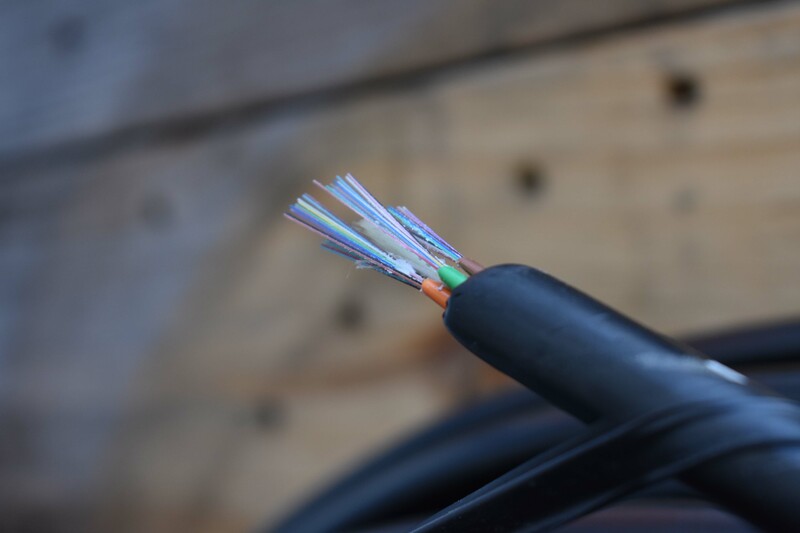 Copper wires in these two types of fiber installations can slow down speeds or cause poor connection as they age. Fiber to the home is a 100% fiber solution and the choice of Mainstream Fiber Networks. We always provide 100% fiber cables wired directly into the business or residence. The process starts with the construction of a fiber backbone that runs along a main road. 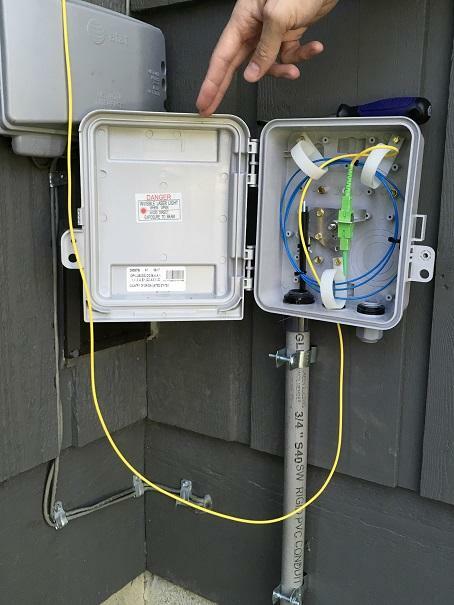 Once the main network of fiber is completed, Mainstream will directly a network fiber cables off of the backbone structure to individual homes. We know the impact fiber can have on the community and individual lives and are committed to using only fiber infrastructure, as opposed to any copper or coaxial telephone line cables. Fiber optics provide the fastest, most reliable form of internet service. These cables operate using light instead of copper wire, meaning that fiber cables will not deteriorate as fast a copper and can be easily upgraded in the future as technology advances and internet speeds increase. 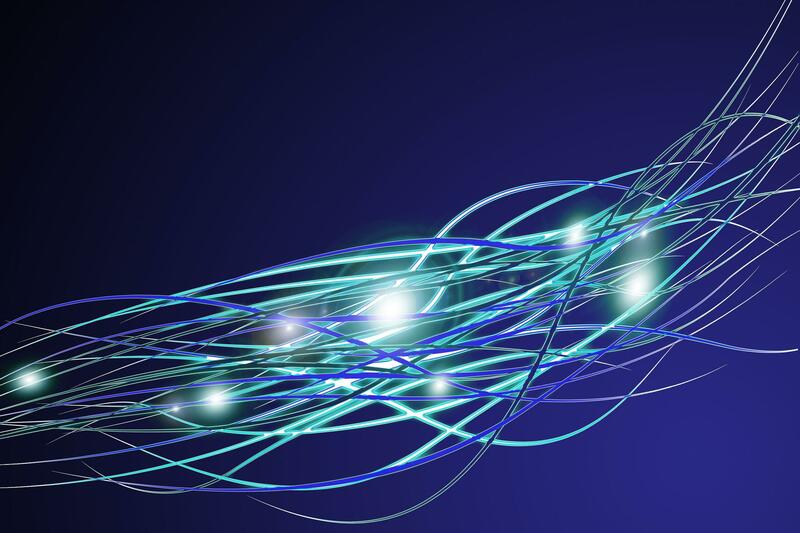 Fiber has a virtually unlimited bandwidth coupled with a long reach, making it ‘future safe,’ or a standard medium that will be in place for a long time to come. 100% fiber will also eliminate some of the hassles of copper lines. Mainstream’s fiber is directly wired into your home meaning the phone service runs off of fiber as well. Direct wiring will significantly reduce static on phone lines, slowed internet speeds due to neighbors’ use, and loss of connection during bad weather. Because the conductor is glass, it does not generate electricity, so fiber is immune to interference that can be caused by nearby power lines or high-voltage electrical equipment. To learn more about our process of installation or to see current construction projects, check out the Expansion Process tab at www.msfiber.net. Do you have trouble connecting with your kids, your spouse, your parents, your community, maybe even your job? Trust us, we know connection is a concern, especially when it comes to reliable internet access. We once had a customer tell us that they would drive (daily) to the local Walmart so that their child could gain a Wi-Fi connection in order to get a decent signal to complete their homework. Let’s think about this for a second. They had to disconnect from the comfort of their home and disconnect from time spent with their entire family in order to connect to the internet for their child to complete a required online assignment. This is just one of the many examples we have heard from community members in rural Indiana areas. have school provided tablets or laptops. In 2015, 24 percent of employed people did some or all of their work at home. How is it that we have come so far with technology, education, and social connection while certain rural regions of this country remain so disconnected? Many, if they are lucky enough to have a connection, must pay a significant amount for services that vary in reliability. We want to provide connectivity to families with school-age children, small business owners, work from home individuals, and many more with the opportunity to connect to real world speeds at affordable prices. Mainstream is a locally owned and operated fiber optic internet provider located in Nashville, IN and dedicated to providing a high speed connection in rural areas where options are limited. Our mission is to provide customers and communities with affordable, reliable fiber optic service solutions and superior customer care. Welcome to our blog. Here we will be connecting you with communities who are growing with the direction of the modern age, showing the benefits and value of high speed internet, and sharing some frequently asked questions about our services.